Tampa, Florida area. (Photo above from 1970 era.) Find more info on Bigelow Mansion of Tampa Page 1. 15326.392 Silas Leland 8 BIGELOW, son of John Boynton 7 ( Silas 6 ,Solomon 5 , Samuel 4, Samuel 3, Samuel 2, John 1) and Martha ( ______ ) BIGELOW, was born 12 December 1841 Brooklyn, NY; moved to Tampa, FL where he died __ July 1913 (suicide? another source says 22 April 1913 of natural causes); He married first Mary L. ______ and married second 27 February 1900 Mattie L. Lucas; he a merchant, real estate and held city offices; 7 children. (This is information from The Bigelow Family Genealogy Vol II; see below: Note1: Note2:Note3: for info gathered by Jean Legereit and myself (photos). 15326.3921 Leland J. (or "G" [obit of bro. John A. ], was given in obituary of Silas Leland and Mary L. as their son by his first marriage. Nothing further known of him in Apr 2000, except that on 15 Sep 1928 he lived in Washington,D.C. 15326.3922 Mary Edith Bigelow, was second of their three children. She married Alvin Robey and 15 Sep 1928 lived in Hendersonviulle, NC. 15326.3923 John A. Bigelow, son of Silas Leland Bigelow, was born in 1878 possibly in Brooklyn, L.I., NY. At age six, he moved to Tampa, FL where he lived for 42 years when he died on 17 Sep 1928, age 50. He was president of the Tampa Sheet Metal Contractors Association, and died at hishome, 704 Louisiana Avenue. He was buried at Oaklawn Cemetery, Tampa, FL. Funeral was at the Tampa Heights methodist church, Rev. T.L.Z.Barr conducting services. The W. Windhorst lodge of Masons, of which Mr. Biglow was a member, will have charge of services at the grave in Oaklawn cemetery. He was survived by two daughters, Misses Annie and Gladys Biglow and two sons, Thomas and Frank Biglow, all of Tampa; a brother and a sister. Mrs. John A. Bigelow died 5 July 1941, age 41 and interred at Jackson Cemetery, Tampa, FL. Miss Barrett was daughter of William J Barrett of Charleston, SC. Her pallbearers were Oscar Worrall, A. D. Pimm, J. L. Brown, Garnet Robey, J.J. Beddingfield and A. E. J. Anderson. Rev. Steinmeyer officiated at her funeral and the address was given 3315 Tampa St.
15326.3925 Charlotte Louise "Louise" Bigelow, was born at Tampa, Hillsboro co., FL in 1904. According to her obituary in the Tampa Tribune on 22 Jan 1926, at age 22, she had married a Bigelow and they had a daughter, Maxine. Relatives accompanied her body from Jacksonville where she died, to Tampa where she was buried. Funeral held at parlors of B.Marion Reed, burial in woodlawn cemetery. Survived by her mother, brother Troupe Bigelow and a daughter, Maxine. records of Bigelow Society historian/genealogist prior to 1995; Rod Bigelow and Jean Legereit 14 April and 18 April, 2000 went to Tampa and Rod took videos of the Bigelow Mansion built by Silas which still stands in beautiful condition and obtained history of the Mansion. On 18 April 2000 Jean and Otto went to the Tampa Library and copied obituaries of Bigelows including Silas and family and records of his activities in Tampa. but his obituary [below in total] does not indicate that. He was a highly respected citizen of Tampa. His second wife, Mattie L. (Lucas) Bigelow was born 1867 and died in Jacksonville, FL 11 July 1942 at age 75, presumably living with her son Troupe who lived in Jacksonville. She died at St. Luke's hospital in Jacksonville. She was survived by one son, Troup (this family used Biglow without the "e") Biglow, Jacksonville and a brother, Eugene H. Lucas, Tampa. The body was taken to Tampa for burial. Bigelow and research 12 April 2000 and 14 April 2000 with genealogist. Library research done by Jean Legereit 18 April 2000.
news of Mr. Biglow's death came as a dread shock to his army of friends, many of whom are pioneer citizens and leaders in the business life of the city. weakened condition forced him to return to his bed. When he reached it his heart failed him. His death occurred at about 7 o'clock. wife are Leland J., Mary Edith and John A.. Those by his second, Troupe L. and Charlotte Louise. Also, he was president of the Bigelow Machine company, a separate line of business with shops on the Hyde Park side of the Hillsborough River. sanitation. When the board of public works was organized he was appointed its secretary, which honor he retained a number of years. Funeral arrangements will be in charge of Undertaker J. L. Reed." located farther back on the property than it is now and was moved nearer Bayshore Boulevard. 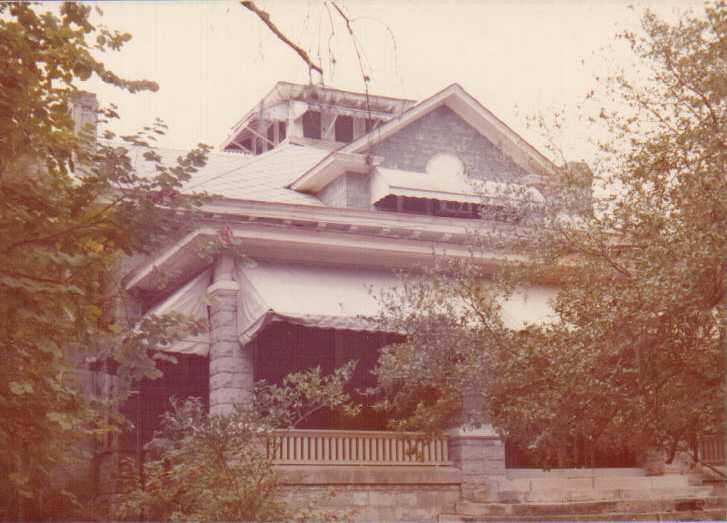 "The Bigelow House also has architectural significance. and visited this mansion, fully restored to A-1 condition and beautiful, 14 April 2000. Carriage house is still there also, in use, and also restored. Townhouse apartments are built on property at the rear of the mansion. (April 2000). illusive ghosts," nor has anyone else she knows of. Westfall, in "Bigelow Mansion a Gold Mine of Local History" which states in part..."history of Mansion and its owners in June 1980 in an effort to place the home on Tampa's list of historical buildings and avoid demolition by developers, stating home sold to Dr. John Helms in 1916 (other dates are 1917 and 1919 in other records). (Dr. Helms used it as Bayside Hospital for eight years so the 1919 date is when it was started as a hospital and could have been purchased in 1916 or 1917); All material related to research and designation of Bigelow-Helms House in on file at -- Historic/Tampa Hillsboro County Preservation Book, 2009 North Eighteenth St., Tampa 33609, Phone 813-272-3843. In Apr 2000, 4807 Bayshore Boulevard is called Bayshore Partners, a general partnership comprised of Tampa Bay Resources, Inc. and Robert Borel-Saladin purchased the property in August 1989 and restored the mansion to as close to original state as possible. Present owner is Lee Scarfone (1988). See photo: Adobe Photoshop5, New Briefcase: biglmansn.jpg. I am interested in becoming a member of the Bigelow Society. Do I need to fill out an application form? Please let me know what I should do. My name is Lois Barkoskie Crew and I live in Tallahassee, Florida. My mother was Beverley Gray Biglow. She was the daughter of Troup Lucas Biglow and he was the son of Silas Leland Biglow of Tampa who built the Biglow-Helms mansion on Bayshore Boulevard. I have quite a bit of information on this branch of the family including the family Bible of John Biglow dated 1840 which lists many births, deaths and marraiges. Thank you. Find more info on Bigelow Mansion of Tampa Page 1.